If you've never used Google Maps Trip Planner before, you're going to be amazed at just how much it helps you organize and streamline your next trip. With the Google Maps Trip Planner, you can plot out your walking tours, put place markers to highlight areas you want to visit, and even use real-time location tracking to make sure you always know where your family members are. So if you're ready to plan your next trip, log into your Google account, and log into Google Maps Trip Planner to follow along. When you first log into the Google Maps Trip Planner page, you'll see a map and seemingly nothing else. That's because the main page is the display map for your planned trips. This display map can contain any layers (individual maps) on top of one another. But before you can add layers, you need to create your trip maps first. To do this, click on the square View larger map icon at the upper right corner of the window. Next, click on the menu icon in the upper left corner of the window. In the menu, select Create new map. Now you're ready to start planning your first trip! Imagine you're planning a trip to New York City. You've made reservations to stay at the Roosevelt Hotel near Park Avenue. You want to take a walking tour of the city but you're unsure how far popular attractions are from the hotel. Google Trip Planner has a useful distance measurement tool you can use to measure how far roads or trails may be when you're actually in a location. Here's how to use the measurement tool. On your untitled map editing screen, click the Measure distances and areas tool (the ruler icon). The mouse icon will change to a crosshair. Use this crosshair to chart your planned walking route along the city streets and to your planned hot spots. Each time you click the mouse, it'll add a new segment to your route. Clicking at each intersection is a good way to measure a city walk. Set the name of this map to NYC Walking Tour. In this example, you can see that walking just under two miles you can visit The PlayStation Theater, Radio City Music Hall, The Museum of Modern Art, Rockefeller Center, and of course a whole lot of shopping along the way. That's an amazing walk around the block. Now that you know all of the locations you want to visit, you can create a set of markers on this map so you'll remember later. To set a new marker on the map, click on the Add marker tool (the thumbtack icon). The mouse icon will change to crosshairs. Just click the crosshair on the map at the locations you are planning to visit. When the marker is placed, you'll see a pop-up window where you can fill in the name of the location, along with any notes. The notes area is a great place to add any reservations or itinerary plans for that location. Just click Save to add that marker to your new map. An alternative method to add markers is to search for the location using the search field. A marker of that spot will show up on the map. Just click Add to map in the informational pop-up to add that marker to your map. In a city like New York, it would be very easy for any of your family members to get lost. However, in an age where every mobile phone has built in GPS tracking, there's really no reason for this. Gone are the days of parents carrying around walkie-talkies to stay in touch with their kids while traveling. Now you can monitor your family's location during vacations by looking for their little blue dot on a map. To enable GPS tracking in Google Maps, just install the Google Maps app from Google Play for Android, or from iTunes for iOS. Tap the menu icon at the upper left corner of the screen. Tap Location sharing from the menu. Choose Until you turn this off, and select all the family members to share your location with. Tap the Share button to start sharing your location. Now you can view the location of your family members as blue dots on a map of the area, right from your phone. You can view your saved Trip Planner maps in Google Maps by clicking the menu icon, tapping on Your places, and tapping MAPS from the menu. If your vacation is a little more off the beaten path, like maybe a hiking trip up into the mountains, it's always a good idea to let people know where you're headed. In Google Maps Trip Planner, on the map you've created, click the Share link under your trip name. Cick Embed on my site. Change the privacy setting to Public for embedding into a blog post, or to individual family members for a social post. Click the three dots to the right of the trip name. Click Embed on my site. Copy the embed code displayed inside the code window. If you're embedding the map to your blog, make sure to switch the post edit mode to code view, and paste the iframe embed code that you copied from Google Maps Trip Planner. Save and publish the post, and everyone will be able to see your trip plans. 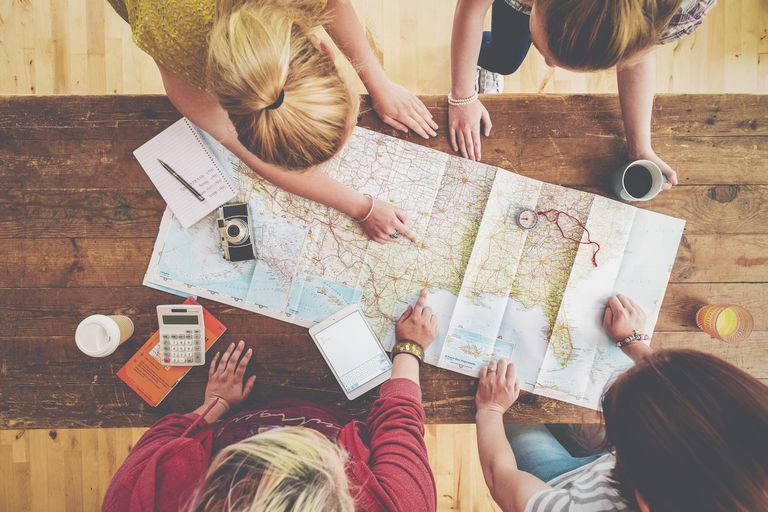 If you want to share your Trip Planner map with friends and family on Facebook or Twitter, click the Share link on your map and copy the link in the Link to share field. When you paste this link in a Facebook or Twitter post, it'll embed an image of the map into the post itself. It's a perfect way to let as many people know where you're headed, and how long you plan to be there. Sharing the fact that you won't be home for an extended period with the public is dangerous, since thieves oven scour the internet for opportunities to break into homes. It's best to keep your map shares limited to friends and family, unless you're a public figure and want your travels to be published to a wide audience. If you want to have a day out during vacation and visit places that are within driving distance of the hotel, it can be difficult when you don't know the traffic patterns of a new area. Log into Google Maps using the same account you used to log into Google Maps Trip Planner. Click on the Menu icon, and then click on Your places. Click Maps, and choose your saved vacation map from the list. Click X to close the Layers menu. Click on the Menu icon again, and click on Traffic. You'll see your saved vacation map with current traffic conditions overlayed on top. Now you can use this map to plan out your route to your first tourist destination and avoid the traffic. The features above are just a few of the best features you'll find in the Google Map Trip Planner. There are a few more you may find useful when planning, or during, your next trip. Layers: You can layer one map on top of another, adding or removing layers as you wish. This lets you create a map view that only contains the locations you want in one, single map. Share links: Directly share your maps to Google Plus, Facebook, Twitter, or Gmail. Draw a line: This tool lets you draw routes onto your map. It'll snap to known roads or trails on the map. Add directions: Use this tool to insert step by step directions one location at a time. You can add driving, biking, or walking directions. Export to KML/KMZ: This feature lets you export your maps in a format you can import into other mapping programs like Google Earth or ESRI ArcGIS. Learn more about KML files. Google Maps Trip Planner looks like a simple mapping tool on the surface. But all of features and tools you'll discover while using it will make it an invaluable tool for your next family vacation.